So, I’m a little late. I know. This weekend has been particularly brutal, so I haven’t had time to write, but rest assured, J and I did go out to dinner Friday after I got home from a long, stressful day. Since I got home pretty late, I didn’t want to travel far. I didn’t really have a taste for anything and really, most importantly, just wanted to do something with J.
I was coming up with nothing when she asked where I wanted to go for dinner. My brain was fried and I was drawing a blank. Luckily, J stepped up to the plate. J takes Stadium to work and a few days ago, noticed the sign outside of the new Los Amigos restaurant said “Now Open.” We weren’t the only ones who decided to check the place out on it’s first Friday night. The place was packed. Los Amigos takes over the space that used to be Buffalo Wild Wings on Stadium Drive. However, if you didn’t know it used to be a B-Dubs, you’d never guess. I never went into the store then, but there is absolutely no way this place has anything left over from the sports bar days. 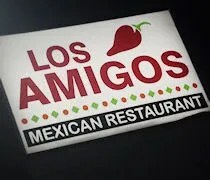 This Los Amigos is a sister restaurant to the Los Amigos in Portage. Again, it would be very hard to tell. The Portage location is a little plain and in a strip mall. It has some Mexican flare, but nothing like the new Kalamazoo location. When you walk, in the first thing you notice is the water feature between the two bathrooms. It does a really good job making you want to pee. The color scheme is a bright blue and orange. There are tile mosaics throughout the space and the very heavy wooden furniture on orange ceramic tile floors make this Los Amigos more of a night out destination than its sister in the strip mall. There was a short wait when we walked in a little after 7:00. Once again, we made it right in time. The line grew quite a bit after we took a seat on the benches near the the hostess station. We were taken into the second dining room and shown to a four top in the middle of the room. There are large wooden booths that could hold at least six people all the way around the space and a couple large wooden table four tops in the middle. Our waiter went to get us Pepsi’s while we looked over the menu and another guy brought us chips and salsa…my absolute favorite thing about any Mexican restaurant and I really like Los Amigos offering. The salsa is served very cold and they bring out individual bowls so everyone has their own. 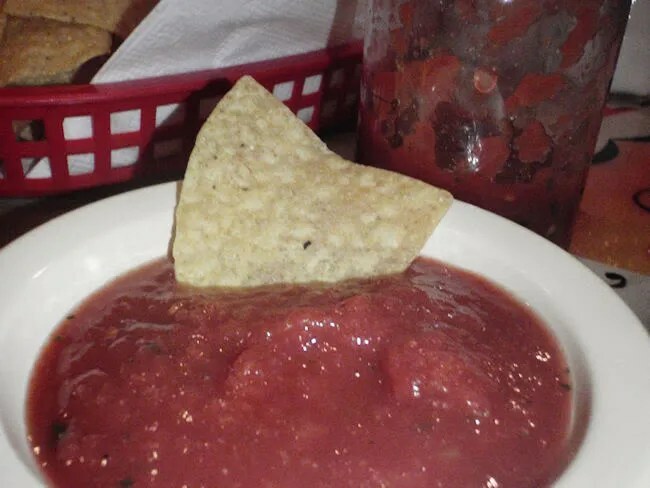 The salsa is served in a small decanter and it’s a very smooth salsa. The chips are home made and lightly salted. I tore through the first basket of chips in no time and before I could even ask, another basket and more salsa were brought out. For dinner, I decided to stray from tacos which is the thing I really like in Mexican cooking. Instead, I ordered the Enchiladas Rancheras. 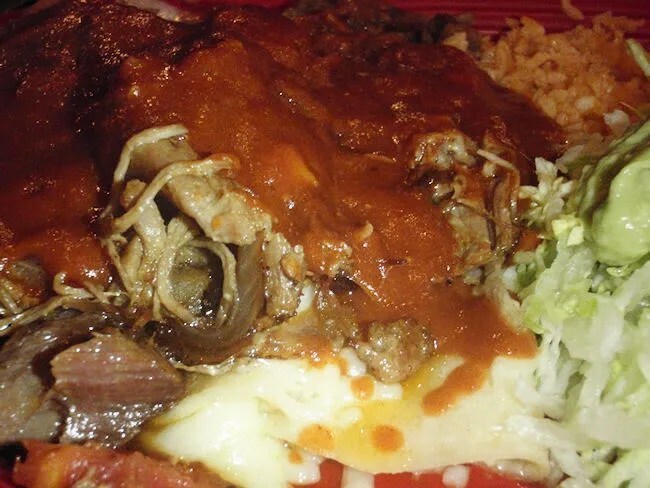 The three cheese enchilada is topped with pork that is slow roasted in tomatoes, onions, bell peppers, and enchilada sauce. The pork was fantastic. It was very tender and had a mild chile flavor to it. The unfortunate thing was that the onions were big pieces and since I’m not an onion lover, it was kind of a turn off to me. It’s not a bad flavor and I knew when I ordered there were onions in it, so I have no one to blame but myself. The plate also came with the usual Mexican rice and a salad with guacamole. I didn’t touch either, but that’s nothing unusual for me. J’s dinner was the Vegetarian Combination A which consisted of a chalupa and a cheese enchilada with Mexican rice and refried beans. Both seemed to go over pretty well and after dinner she said it was a place we could definitely go back to. Our bill was a little over $21. 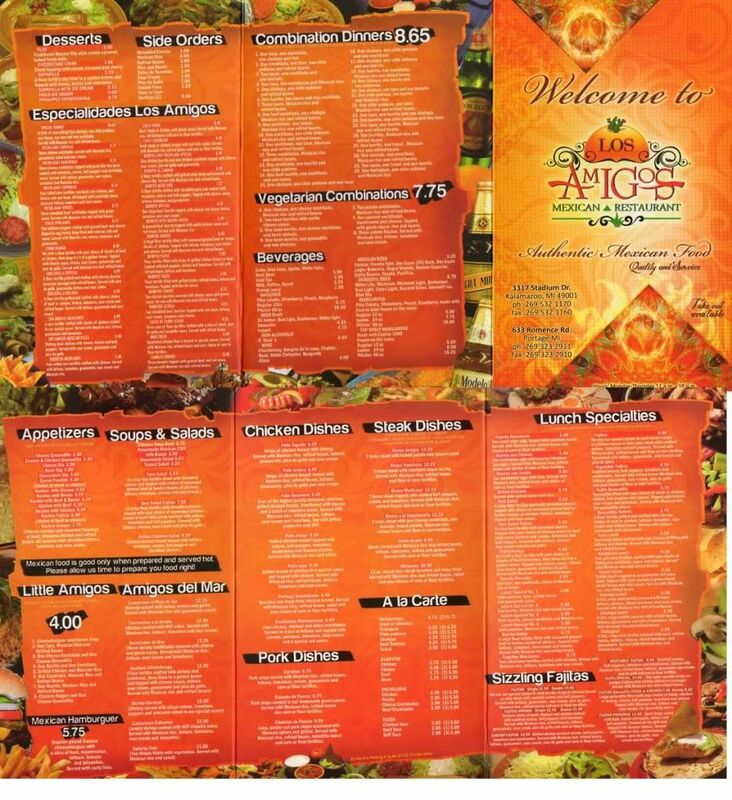 Los Amigos is right on when it comes to us and Mexican food. I still get told I don’t know what “true Mexican” food is, but I really like the new Los Amigos location and that’s all that really matters. As far as I can tell, it’s the only Mexican joint on this side of town which should go over pretty well. It’s good, but Mi Ranchito right down the road has the Mexican theme and spades and the food is more authentic and in my opinion better. 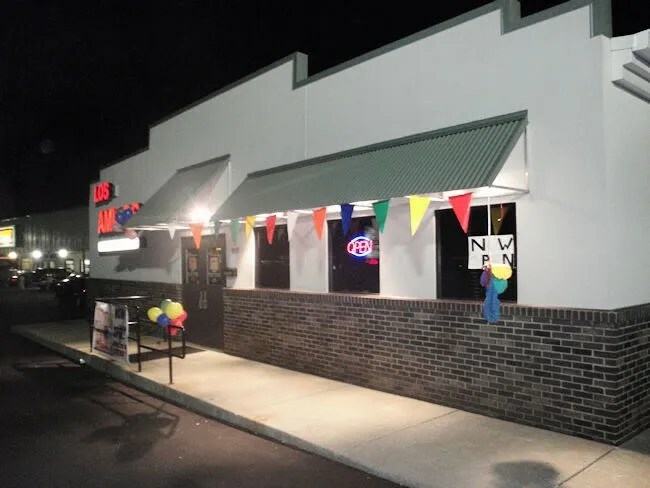 Los Amigos is a good place for college kids looking for some Mexican American food down well. Hopefully they know to have good drink specials. We went Friday night around 9:00. The place was about 1/4. The food was outstanding. Unfortunately for us a 6 person party sitting right in the middle of the place was extremely loud, rude and disruptive. The had NUMEROUS empty blasses and tall mugs at the table so one could assume that a lot of drinking was taking place- yet they continuted to be served even after we complained that their behavior was ruining our dining experience. At the check out Lucy was extremely rude to us when we asked her why they were still being served and her response was “I’m not their server”. We may go back since the food was good, but never again for dinner if the waitstaff doesn’t know how to control unruly patrons. Honestly, Los Amigos was far better than I was expecting based on all the reviews I’d read on yelp & urbanspoon. I had the carnitas and they were awesome. I can’t stay enough good things about it. I’ve been to Mexico many many times and not the tourist part of Mexico. This one dish I had compared to what I’d get down there. Crunchy outside and fall apart tender. If a restaurant doesn’t have carnitas on the menu, they can’t be considered authentic. That is why it surprised me Mi Rachito doesn’t have it based on all the stuff I hear about them. Honestly, I don’t understand all the love for them. Los Amigos, La Pinata, and El Jimador are all better Mexican restaurants locally. On another note, their $3.99 margaritas from 3-close are a good deal. They don’t skip on the tequila. I’m guessing it’s well, but at least it tastes like decent well. On their marquee, this location is now advertising new late night hours starting on September 5. 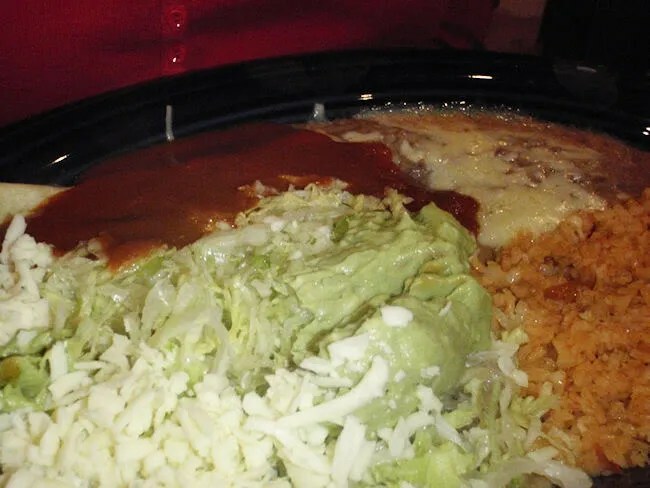 Since then, you’ve reviewed the Qdoba ( https://swmichigandining.com/2011/05/15/qdoba-mexican-grill-main-street/ ) and Chipotle ( https://swmichigandining.com/2011/12/31/chipotle-mexican-grill-oshtemo-township/ ) on W. Main St.